This trip, which started so well, has gone to hell in a handbasket. Lunch today was a picnic, which is good. It was a ham sandwich, an apple, a bottle of water and a cookie, which is OK. It was for 2 people, which is not. That’s one sandwich, one cookie,one apple and one water to be shared per couple. Not one each, one for both. Kate and Toby didn’t have to share their sandwich, Toby won’t eat ham. There were no options. This was bad, but not the deal breaker. It’s a dump. I think it’s the Motel Sechs. No glasses, just two plastic cups. 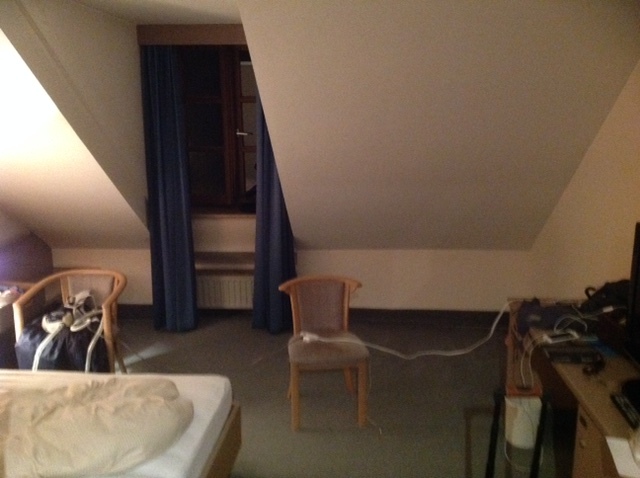 No electric outlets–I had to unplug the lamp and string an extension cord (which I carry for days like this) to plug in my CPAP machine and sleep. That was bad, but it wasn’t the dealbreaker, either.We went to dinner. Andreas came over and informed us we owed him €18 for our lunches. Gail did not take that well. Andreas did not take her response well. Excrement met impeller. Definite dealbreaker.Time to leave. We needed a car to take us to Munich in the morning. I called the Travel Goddess, but she was not home. Then I got a bright idea. Because we travel so much, I have one of those fancy Citi cards which gives me American Advantage miles, no foreign transaction fees, Admirals Club entrance and concierge services. I had never used the last of these, but today was the time. Calling the concierge number on the card, in relatively short order I was talking to Norma, in Minnesota. She worked out where we are, where we want to go and the best way to get us there. She spent 45 minutes on the phone with me, but by the time we were finished I had confirming emails from a limo company who will com get us tomottow at 10 am. By strange coincidence, that’s the same time our coach is leaving. I really wanted to like this trip, and indeed most of it was excellent. The trifecta of a rotten lunch, a miserable hotel and inexcusable behavior by the owner, though, was too much to overcome. Tomorrow we are in a 5 star hotel the Travel Goddess found for us. Life will be better. Chris forgot to tell the picnic spot only has a tree for a toilet! One of the ladies was in a long skirt. I didn’t ask her how it went….